Tomatillo Salsa Verde is one of my favorite food discoveries of the Southwest. It differs from red enchilada sauce as it is made with tomatillos instead of chiles. I love salsa verde on anything but particularly on enchiladas. I had never heard of a tomatillo or salsa verde until we moved out west 6 years ago. If they were available on the East coast, I certainly didn't pay any attention to them! My introduction to salsa verde was in Albuquerque, New Mexico when a waiter asked if I wanted my enchiladas “red or green.”. He was asking what kind of chili sauce I wanted and since I had no idea what I'd like, I told him to bring me both. I fell in love with salsa verde at that meal. This super easy and quick recipe means salsa verde can now be a staple in my kitchen. Finding a bag of tomatillos on manager's special for $.22 makes this even better! 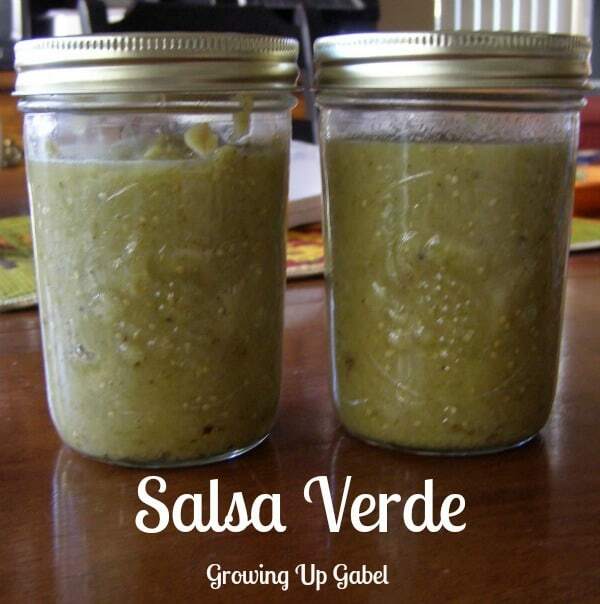 If you aren't familiar with salsa verde, you can use it like taco sauce, salsa, or enchilada sauce. Heat oil in a large skillet. Cook all ingredients until the tomatillos are softening and brighten a bit in color, about 10 minutes. Put everything in to a blender or food processor and blend until liquid. Rebecca from Who Needs a Cape? Love Salsa Verde, makes me homesick for New Mexico. Found you over on Couponing & Cookings linky party. I have always wanted to try making this! Thanks for sharing. I can’t wait to try this Salsa Verde, it looks soooo good. Your recipe is fabulous and thank you so much for sharing with Full Plate Thursday. Have a great weekend and come back soon! It sounds great. I have only made salsa but not verde salsa. Can’t wait to try it! Nothing better than popping open a jar of summer in the winter! Tomatillos are pretty easy to grow. I had a few plants in my garden several years ago. I don’t remember the deer bothering them. Great idea! I’m a terrible gardener, though. Still haven’t adjusted to desert gardening. We love salsa verde at our house. I’ve never made it before. I can’t wait to try it. Thanks so much for sharing. Have a great day! Thanks for stopping by, Brooke! I keep an eye out at the farmer’s markets for the tomatillos! Hi, what a great idea. I would add even more Lime!! Visiting you from Mix It Up Monday!! Oooh, I might have to up that next time to see how it tastes. Great idea!